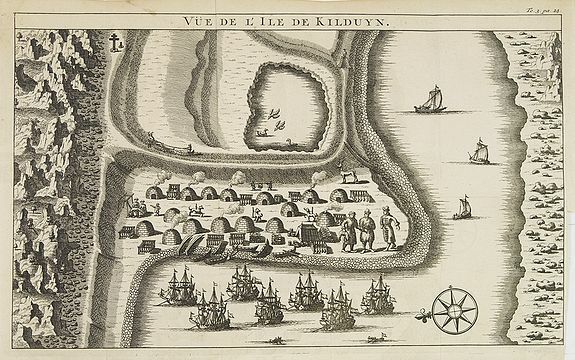 ANONYMOUS -Vüe de l'Ile de Kilduyn. ANONYMOUS - Vüe de l'Ile de Kilduyn. Title : Vüe de l'Ile de Kilduyn.. Size : 6.8 x 11.1 inches. / 17.2 x 28.2 cm. A view of the Kilduyn Island on the Kola River in Russia. In upper right corner "To. 3. pa.24." The Kola River in the northern part of the Kola Peninsula, northwestern Russia, flows into the Barents Sea via the Kola Bay. The river is a unique place for reproduction of salmon and an important source of drinking water for more than 500,000 people in Murmansk and the surrounding municipalities. Condition : Engraving. Short margins and lower right margin cut to plate mark. Else good condition.